Do you have a passion for Civil War history? Are you interested in finding a good hobby for you to share that interest with others? 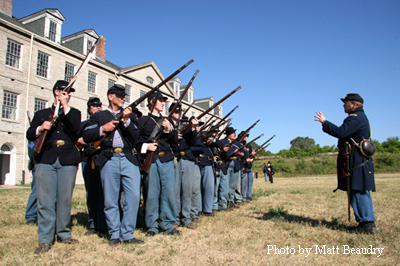 Civil War Re-enacting - This hobby involves dressing in the uniform or civilian clothing of a person of the era. Soldiers may participate in re-created battles. Civilians bring homefront experiences to life. There are many clubs in the state whose members portray different aspects of life during the war. There are even Confederates! 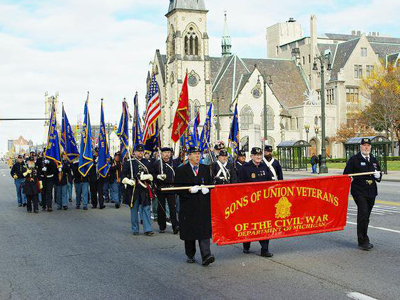 These groups participate in events in Michigan and many also travel together to events at actual battlefields. Go to the Re-enacting page to find contact information for the groups in Michigan. Where possible, we will provide with with a web contact for these independent groups. Competative Shooting - If you enjoy shooting firearms competitively, a shooting hobby might interest you. There are several national organizations with clubs or chapters in Michigan whose members enjoy dressing in period dress and competing in live shooting at ranges. To do this, they use accurate reproduction weapons. Learn about these clubs in the Shooting page. Reproduction Uniform Makers - If you get involved in either hobbies above or if you want period clothing for an event at a historical society, you are in luck! 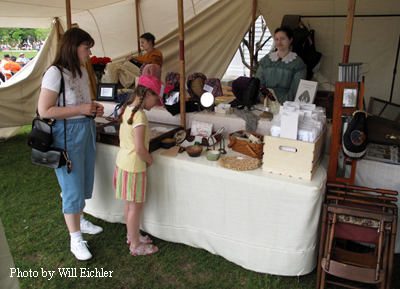 Many of the items you need to portray a soldier or civilian of the Civil War era are produced right here in Michigan. Learn about these in-state businesses in the Vendors page. Roundtables - Maybe dressing up in wool in the middle of summer isn't your idea of fun. Don't worry. If you have a passion to learn more about the Civil War and visit with others who do, there are Civil War Roundtables across the state. A roundtable is a group of history buffs who meet regularly to discuss aspects of the war. Roundtable meetings often have guest speakers presenting lectures on various topics. Some roundtables take regular trips to battlefields and other historic sites. Find a Roundtable near you in the Roundtable page. Fraternal Organizations - There are several fraternal organizations for those who have ancestors who served in the Civil War, on either side. Find one close to you on the Fraternal page. Genealogy - Many people find great satisfaction learning more about where their family came from and what role they might have played in the Civil War. Sometimes it is done to locate where a family member is buried. A knowledge of your family genealogy is a first step in joining any of the fraternal organizations in the segment above. Find resources to help you track down an ancestor or other Civil War soldier on our Genealogy page.